Connect any identification method to an agreement. Need to identify signers beyond the standard practice of clicking an emailed link? DocuSign Identify has a spectrum of choices. Easily include a preferred ID method to streamline the eSignature process, reduce risk, and remain compliant. Choose among packaged ID methods from DocuSign and third parties, or integrate your own via API. Integrate signing and identification, including automated ID checks, into one connected experience. Fulfill compliance requirements for regulated and other advanced use cases. DocuSign Identify is our suite of ID verification and authentication methods. The Identify Platform supports integration with your existing identity verification method, such as an existing customer portal. Please contact sales to learn more about our identification method. What if I want to add a different identification process from what you provide? The Identify Platform is a plug-and-play, open API framework that allows customers to configure any type of identification process into DocuSign eSignature workflows. With our open APIs, you can integrate your own custom-built solution, such as a customer portal you already have, or you can use an ID solution from a trusted third-party partner that is already integrated with DocuSign. What types of agreements do DocuSign’s Identify solutions support? How does DocuSign’s ID Verification product work? 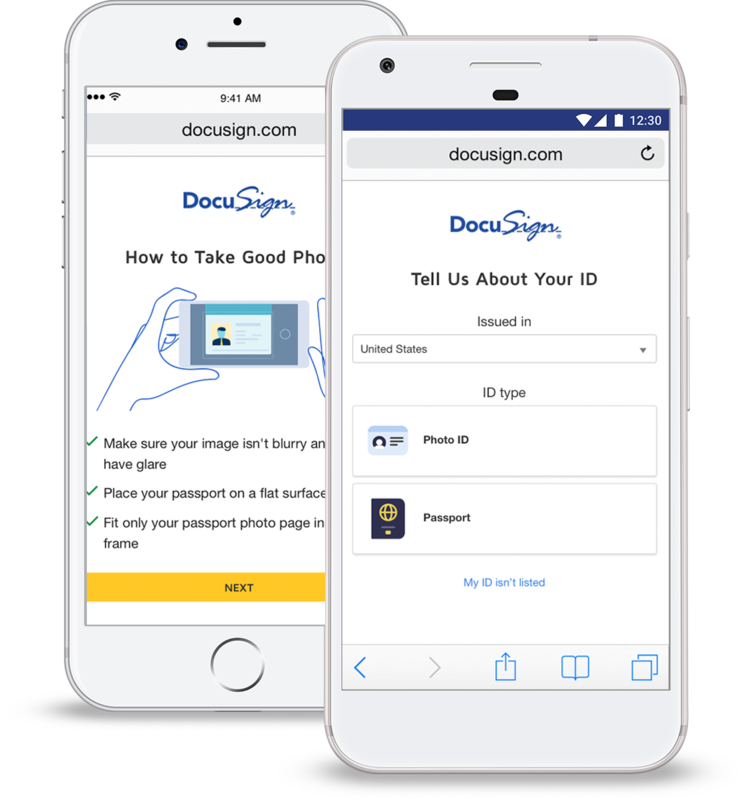 DocuSign ID Verification is fully integrated with DocuSign eSignature, enabling customers to securely verify signers’ identities within DocuSign workflows. The signer’s mobile device or computer receives an email with the agreement. After a successful verification, the signer can view the agreement and sign as usual. Can I purchase any Identify products as a standalone? All Identify solutions are available as add-ons to a DocuSign eSignature plan. Please contact us to learn more about the best option to meet your needs. Do any of the Identify products support eIDAS? eIDAS governs the usage of electronic signatures across the European Union. DocuSign has EU-specific ID verification options to meet both Advanced and Qualified signature levels under eIDAS, especially when combined with our Standards Based Signatures offerings. Please contact sales to find out the best solution for you.